A team of Purdue engineers are designing and building a vehicle for Hyperloop, the new transportation system first proposed by SpaceX. For its upcoming competition, Purdue has joined forces with Universitat Politecnica de Valencia (UPV), in a unique trans-Atlantic collaboration. "This may be the future of transportation," said Guillermo Paniagua, professor of mechanical engineering, and Purdue Hyperloop's faculty advisor. "The idea is to build a tube that can operate in a near-vacuum, and use a vehicle that can levitate off the track. With almost no drag to overcome, that vehicle can potentially go very fast." Hyperloop proponents claim a potential top speed of 760 miles an hour -- or being able to travel from Los Angeles to San Francisco in 35 minutes. The problem? Neither the track nor the vehicles exist yet. "These pods have no flight heritage," said Diego Martinez, senior in Aeronautics and Astronautics. "We can do simulations and analysis to propose the best design, but there's no easy way to prove what works and what doesn't without building them." Several companies are developing their own designs, but Elon Musk of SpaceX (who originated the idea in 2012), has chosen an open-source approach, encouraging universities to pursue their own original plans. He organized a design competition in 2016, and then in January 2017 a real-world contest on a mile-long test track at their Hawthorne, California headquarters. "Going to SpaceX was every nerd's dream," said Martinez. 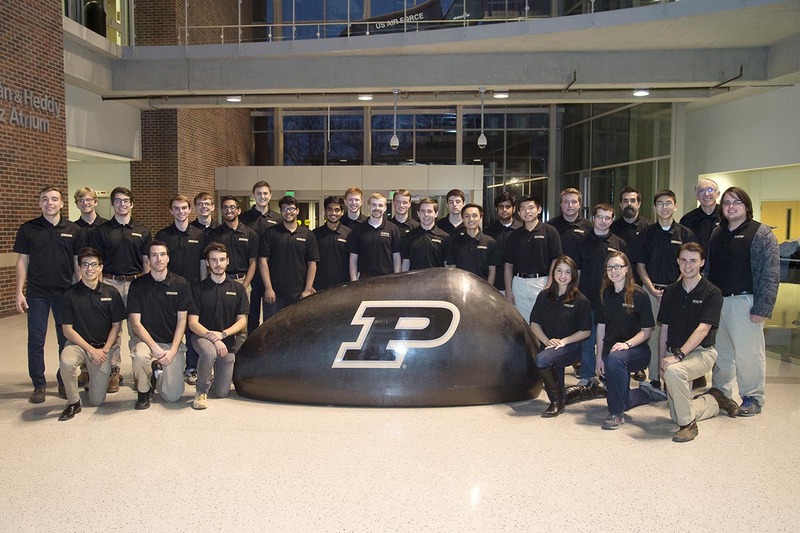 "Elon Musk was there, and commented on how Purdue's pod was the only one built exclusively out of carbon fiber." More than 50 team members of Purdue Hyperloop, from all engineering disciplines, had spent the last year designing, testing, and building their prototype before making their way to California. Purdue Hyperloop finished seventh out of 30 teams. For the next competition in August 2017, the main goal is speed. As such, Purdue Hyperloop is building a new pod, and collaborating on the design with a university in Spain. "I knew about the Purdue team and what they were doing here," said Pedro Martinez Lopez of Universitat Politecnica de Valencia (UPV), whose Hyperloop team won the initial design competition in 2016. "I thought it would be cool to start a trans-Atlantic collaboration -- the first in the history of Hyperloop!" "The UPV team are doing a lot of the design and avionics work," said Paniagua, "and then we are manufacturing the pod here at Purdue. It's really combining the best theoretical work and the best hands-on skills from both continents." Collaborating across an ocean isn't always easy. "We use Skype a lot," said Martinez, "and there are some differences in language, and units of measurement. And we all have classes, so finding the right time to meet up online is the hardest part!" All team members have the same goal: create a Hyperloop vehicle that is fast, but also viable in the real world. "I think that we will see a real-world Hyperloop in my lifetime," said Martinez. "There are so many people working on the technical challenges, that we have the potential to create a whole new form of transportation."